Tis the season to be hungry! The holiest month of the year has finally arrived once again for Muslims. During this time we are expected to contemplate, and free ourselves of distractions in order to focus on capturing the nature of the Islamic teachings. This deep cleansing and productive reflection is of course accomplished by refraining from eating from dawn to sunset (yes, even water). With that said, it may be counterintuitive to share our list of traditional dishes from around the Muslim World. But, in our defense, perhaps this post will manage to subdue the hunger felt by giving us something to look forward to. This post is also a celebration of culture and food from around the world. Safe to say, Iftar is one of the most anticipated event of each day during Ramadan. We thought it would be interesting to compile a list of what others eat to break their fast. What does your culture eat for Iftar? Couscous - This dish comes from the beautiful, picturesque North African country, Morocco. Anything that originate from this country has an aesthetic please, but this dish goes above and beyond looks. Couscous is often served with meat and includes a number of different vegetables combined with chickpeas. This blend makes for a nutritious meal and is especially fit for Ramadan because of its high protein! Extra fun fact: Moroccans refer to Friday’s as ‘Couscous Friday’ because that’s when it is traditionally served! Burek (pita) - A Balkan/Turkish classic! This dish’s origins date back to the Ottoman Empire and is enjoyed throughout Eastern Europe. With meat wrapped into a dough, with a thin top layer of pastry, this spiralled, delicious meal is sure to feed the entire family (and guests). Perfect for Ramadan Iftars and dinners. But, be sure not to skip the sides that are commonly served with this dish: yoghurt and refreshing salads! Okra Stew - Sudan is known for its soups and stew. One of their most popular stews is this Okra stew! Which also includes lamb meat and a range of spices. The Sudanese people recommend eating this with either chapati, rice - or both! Another high protein dish for this list, making it the perfect meal for Ramadan. Random fun fact: Notice the way they serve their food! Nafaqo - This Somali word literally translates to “nutrition”. If that doesn’t sell you, wait until we tell you what’s in it. These are egged stuffed potatoes with a 10/10 presentation and special techniques to achieve such appearance. 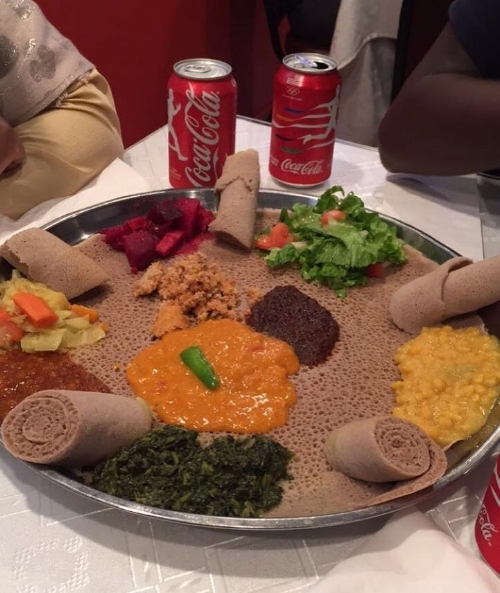 This Somali appetizer really butters you up for the main course! Depending on the area, some Somalis use ground beef in the place of potatoes. Which is better? We can’t decide! Fata - Do you like crispy bread? What about rice? Meat? The Egyptians have you covered. They’ve combined all three to create a layered dish of taste bud paradise. With the crispy bread as the foundation, followed by a middle layer of rIce, and a top layer of lamb and sauce, this dish is a must for Ramadan. Another fun fact: Egyptians are known for their love of fish. It’s a platter reserved for special occasions! Samosa - Everyone is bound to have heard of or tried a samosa in their lifetime, we had to include them on our list. With Desi origins, this snack-food is irresistible when combined with it’s sweet and spicy chutney dip. Is it even an iftar without samosas? Ayam Masak Merah - Literally translates to “red-cooked-chicken”. This dish is traditionally served exclusively on Eid. But, some Malaysians will make an exception and serve it for iftars when there are enough guests! Although it may look a lot like Chicken Curry, it’s very different in flavor and texture. It’s a fantastic dish that’ll surely keep you coming back for seconds! Ingera - If this isn’t the prettiest way to present food, we don’t know what is. This Ethiopian/Eritrean dish is a classic and a super effective way to gather the family during Ramadan. Funny enough, this dish has dishes within in it! That’s right, there are a number of different sauces and dips to select from ranging from beef to spinach. Yum...very perfect for Ramadan, wouldn’t you say? Did we miss out on your nations Iftar food? What are you eating this Ramadan? Let us know in the comments!